What Is in Black & Milds? Black and Mild's are shaped like cigarillos and come in seven different varieties. They were created by the John Middleton Company in King of Prussia, Pennsylvania, and were developed to spread the use of pipe tobacco for people who had no time or experience smoking a pipe. Black and Mild cigars are made of 100 percent pipe tobacco. 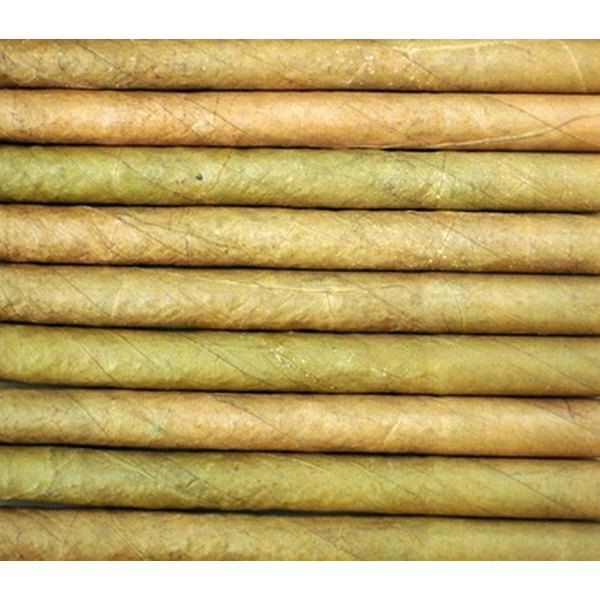 The main tobacco leaf used in their products is burley. Other kinds of tobacco that may be used are flue-cured, dark-fired, Latakia, Maryland, Oriental, sun-cured, fire-cured and Perique. Black and Mild cigars come in many varieties that range in flavor. They are available in natural, cherry, apple, wine, cream, mild, wood tip and wood tip wine. You can also purchase loose Black and Mild tobacco sold in pouches. The best selling five-cigar pack in the United States is the Black and Mild brand. There are three varieties of pipe tobacco — aromatic, non-aromatic and English blend. Aromatic tobacco has casings added during the manufacturing process then flavor such as chocolate, vanilla or cherry is added. Non-aromatic tobacco is kept in its natural state but is usually aged or fermented for sweetness. English blend tobacco has no additives and is mostly made of Oriental tobacco like Latakia.